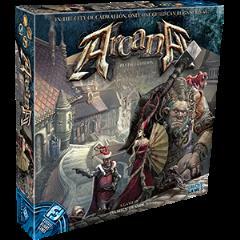 The revised edition of Arcana introduces two new guilds, and six new rule options for players to choose from, or play with them all for a more challenging experience. Players can customize their guild, fulfill objectives, recruit Militia, invoke the ability of their Guild Masters, affect game play through random events, or optimize tactical strategy through card discards. Which variant will you use in your game?